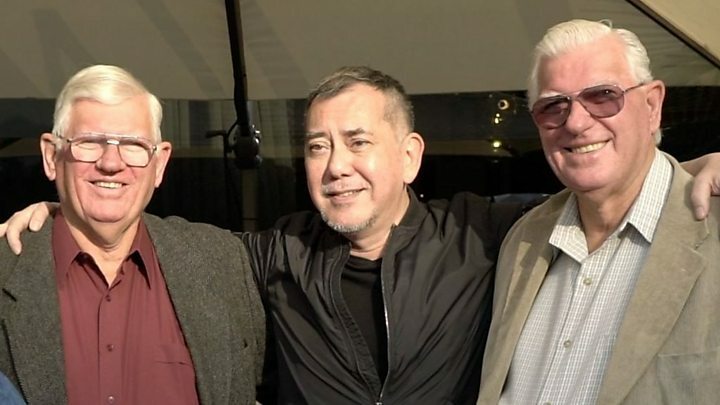 Hong Kong actor Anthony Wong spent decades looking for the father who left him as a child. Now, he says a BBC report on his search has helped him find a family who never knew him. It's late March, and three men are gathered for a meeting they'd never thought they would have. One man is Anthony Wong, one of the most famous actors in the Chinese-speaking world, known for his roles in films like Infernal Affairs and The Mummy: Tomb of the Dragon Emperor. The other two are silver-haired, 74-year-old Englishmen - Anthony's two half-brothers that he had never met until last week. "Amazing, impossible - a miracle" is how the actor, 56, described it. For decades, the celebrity looked for traces of his British father, who left him when he was four. Fragmented information from his Cantonese mother about the former Hong Kong government official had led him nowhere. He knew only his name - Frederick William Perry - and had some basic biographical details and a handful of photographs. Earlier this year, Anthony spoke to BBC Chinese about his search. He described how, without his father, he had grown up feeling "trapped in between" his British and Hong Kong identities, and how he hoped the internet would help bring him some answers. The day after the BBC published his story, a Facebook thread was set up by people wanting to help him. Three separate women following the page around the world began looking for information and passing it on to him. "New clues came almost every day," Anthony said. On 2 March, he sent another post saying that someone had found biographical information of his possible father and his English family. He could hardly dare to believe they were his relatives, but the names and years seemed to match perfectly. "I was like, 'no way!'" he says. Why was I left on a hillside to die? At the same time, John Perry, 74, was on a cruise ship in the Pacific with his twin brother, David. They picked up an email from a cousin in England saying there was "a rather sensitive matter I should know about", says John. Meanwhile, David's son sent him a photograph from the film, which showed Perry Sr holding Anthony as a baby. When they got back home to Melbourne, Australia, where they have lived for the past few decades, they watched the BBC story and saw a man who was, without question, their father. "We were quite amazed about the whole thing," John says of the moment they saw that video. Not knowing how to contact Anthony directly, they emailed a company mentioned in the video, Dionysus Contemporary Theatre, saying there was a chance that they and Anthony were "half-brothers at least". When they were finally able to get in direct contact with Anthony, David and John were shocked. "After picking myself off the floor, we talked about it, Dave and I. And we decided we'd better come over and see him," said John. On 20 March, the three met in Hong Kong. "It was just incredible," Anthony said. "After all these years and suddenly it all happened in two weeks!" "We hit it off straight away," said David. Sadly, Perry Sr had died in 1988. The Perry brothers say he had never once mentioned his second family. "We had no inkling about what happened," David said. The brothers spent their meeting piecing together the missing parts of their lives. Anthony learned that Frederick William Perry was a Royal Air Force veteran, who served in the Battle of Britain. In 1955, he arrived in Hong Kong - then a British colony - to work in a government logistics office. He brought with him his wife Vera Marjorie, their daughter Vera Ann, and twin sons John and David. A few years later, the family visited the UK. John and David stayed to join the RAF, but Frederick returned to Hong Kong. "That year or soon after, he must have met Anthony's mother," said David. According to Anthony, who was born in 1961, Frederick Perry left him and his mother, Wong Juen-yee, in the mid-60s and moved to Australia with his other family. They exchanged letters for a few years, but all contact was lost when Anthony was 12. After serving in the RAF, David and John moved to Australia to join their father. David said he would've liked to have known about Anthony long ago. But both brothers said they weren't upset at finding out the secret that was kept from them for decades. They believe their mother, who died in 1972, wouldn't have known about it either. "We know sad things happen in life to a lot of people," said David. "The main thing was to come over and meet Anthony, and get into some background of what happened." They believe their father would be pleased they're all finally in touch. Anthony's mother is still alive, but is suffering from dementia. He tried to tell her he had found his father, while he was helping her eat dinner, but she could not give a clear response. "She suddenly stopped eating," said Anthony. "Then I said 'hey, I'm not leaving you. I'll still be here', and she went on eating." David and John spent a few days in Hong Kong with Anthony before returning to Melbourne. All three told the BBC that they had formed a bond very quickly, and the "fairly big" Perry family would love for him to visit them in Australia. "We want to have a nice get-together and make Anthony feel part of our family - he is part of our family," David said. The brothers knew nothing about Anthony's acting career. But they have started delving into the internet to find out about the veteran film and stage actor, who has starred in more than 150 movies and won four Hong Kong Film Awards trophies. They stressed that Anthony's fame was not a factor in their reunion. "Whether he's being an actor or a labourer, it wouldn't make any difference to us," David said, adding they would have still come to meet him. Anthony said their meeting helped him, through knowing more about his family, find out more about himself. "I played music and it turns out my brother did, too. I trained in boxing and it turns out my father had been a middleweight champion," he said. "It's so amazing - it's like all those things were in your genes." He called this "a life lesson", that when he is finally able to make peace with the past, a new journey can begin. "Dad used to say in his letters that if I was a good boy, he would take care of everything for me," he said. "I think he knows I've become a good boy since then and he's sent two brothers to me." Who were my parents - and why was I left on a hillside to die?